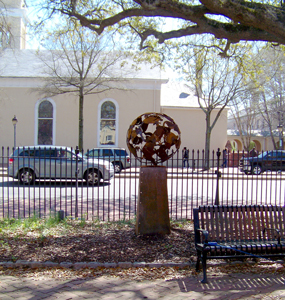 "Interloctangles II" in the Courtyard Gallery at Courthouse Square in Olde Towne Portsmouth, VA. About the 2019 Outdoor Sculpture Exhibit <here>. Historic preservation and restoration of a Tiffany Studios entrance canopy illustrated in a slide show presented by Anvil Works. Reception afterward. 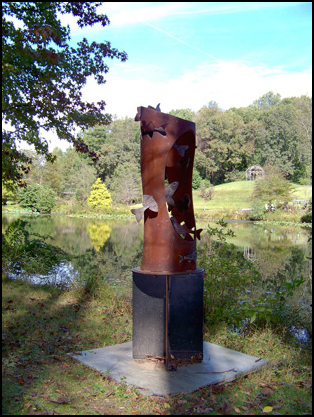 Lee Badger's sculpture "Reel Thing" now appears on the walking trail around Lake Gardiner. Lee Badger exhibited andirons recently published in Hammer's Blow, ABANA's magazine of methods, skills and techniques. June 1-30, 2018. Produced by Maserka|Sol Entertainment Group. 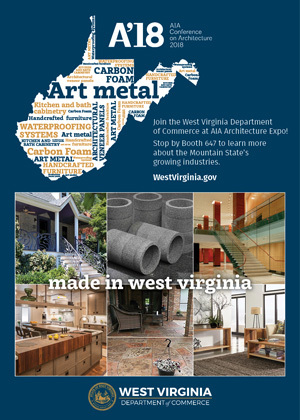 The West Virginia Department of Commerce hosted Anvil Works at a booth in the Expo hall of the Javits Convention Center in New York City. 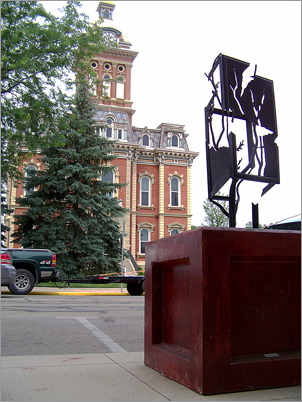 Lee Badger's "Cabinetree" is across the street from the beautiful Adams County Courthouse. 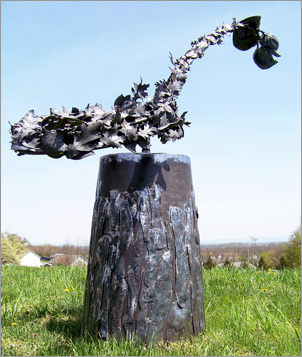 More about the 2018 Sculpture Tour <here>. 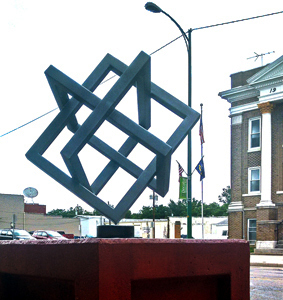 "Hats Off, Blown Away" is Lee Badger's latest sculpture, now appearing in Mason City, IA's annual public art exhibition. Learn more <here>. 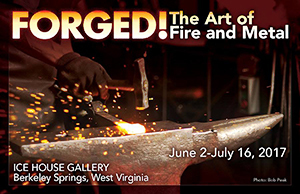 "Fowl Ball II" in the Courtyard Gallery at Courthouse Square in Olde Towne Portsmouth, VA.
Lee Badger's newest work, a pair of fiery andirons, and two older pieces appear among the work of 20 distinguished local artist-blacksmiths. 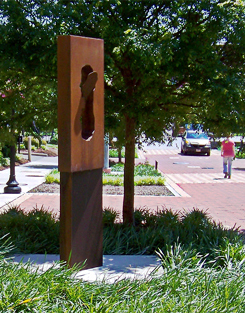 One of ten sculptures along a pedestrian corridor in downtown Roanoke, Lee Badger's sculpture "Sow above, So Below" has kinetic turning heads. 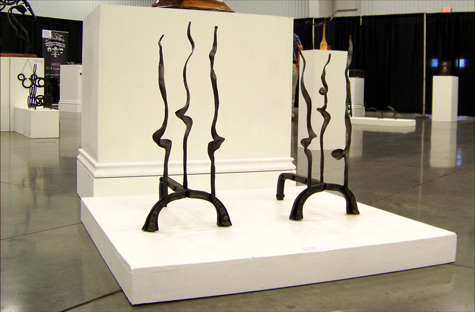 Decatur, IN featured Lee Badger's sculpture "Interloctangles" in their annual exhibition downtown. 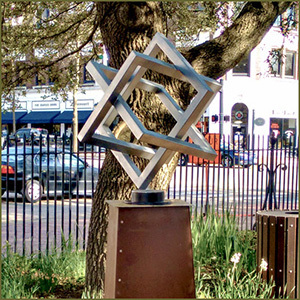 Lee Badger's most widely exhibited sculpture "Comma" appears at Five Points in front of the Lind Pavillion at the Shake Rag Alley Center for the Arts for three years. 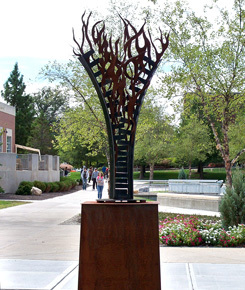 Airy flames are unzipped from a steel I-beam in Lee Badger's sculpture "Firefly," part of the University's permanent collection, on display at the northeast corner of Smith Mall between Schwitzer Student Center and Lily Science Hall. "Waldgeist," Lee Badger's presentation of the mythological Phantom of the Woods was purchased for the permanent collection in 2015. 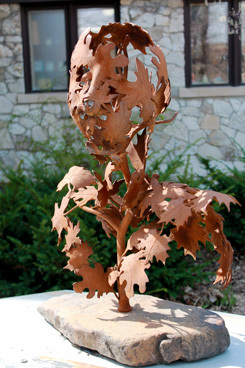 The sculpture is displayed near the city parking lot on First Street Northeast and Delaware Avenue.